LIVERPOOL will be top of the English Premier League at Christmas after beating Wolverhampton Wanderers 2-0 thanks to goals from Mohamed Salah and Virgil van Dijk. Salah became the league leading scorer, on 11, when he produced a deft flicked finish to turn in a driven cross by Fabinho in the 18th minute at rain-hit Molineux on Friday (local time). Salah also provided the cross that was guided in left-footed from close range by Van Dijk, capping a brilliant overall display by the Dutch centre-back at both ends of the field. Liverpool extended its unbeaten start to the league season to 18 games and ensured it could not be toppled by Manchester City before Christmas. Second-placed City, the defending champions, trail Liverpool by four points ahead of their home game against Crystal Palace on Sunday morning (1am, AEST). Eight of the last nine champions in the Premier League were top at Christmas. "It was perfect football, especially on a night like tonight when it was difficult to play proper football," Liverpool manager Juergen Klopp said. With Liverpool looking so solid at the back - producing their 11th clean sheet so far - and increasingly lethal going forward, questions will be asked if Klopp's team can go through the campaign undefeated to match Arsenal's feat in the 2003-04 season. It's distinctly possible if Liverpool's two signature players keep performing. Salah seemed slightly short of confidence in the early months, particularly when he snatched at chances in front of goal, but he looked back to the kind of form that made him last season's top scorer (32). He has moved ahead of Arsenal striker Pierre-Emerick Aubameyang in the scoring charts and isn't too far behind his incredible scoring rate from last season, when at this stage he had 14 goals. 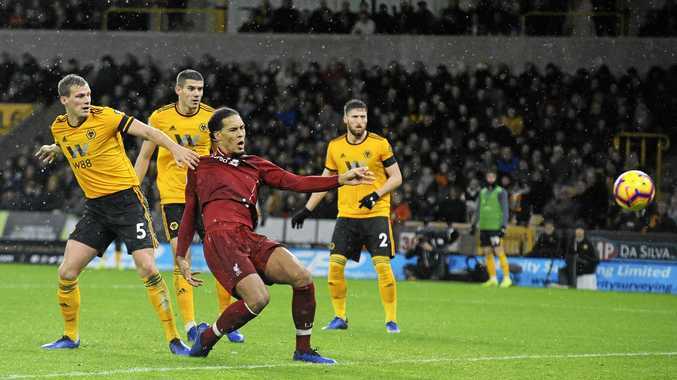 Then there was Van Dijk, who was majestic at the back in clearing high balls into the box and, at one stage in the second half, even outpacing the Wolves' jet-heeled forward Adama Traore as they raced down the right wing. The Netherlands international has always had an eye for goal - he scored on his debut for Liverpool last season, for example - but this was his first of the season for the club in any competition. The one negative for Liverpool was the sight of midfielder Naby Keita being forced off the field in the second half with an apparent lower back injury.